I love this sweater that my friend, Barbara, handknit for my first baby. It has been handed down since then to each of my daughters to wear on cold days. You would think it would be a tattered mess after four children, but it is as lovely and warm as the day I unwrapped it from its nest of tissue paper and ribbon. I'm convinced it possesses magical properties—the kind of magic found only in gifts made with painstaking care. 1. It endures. 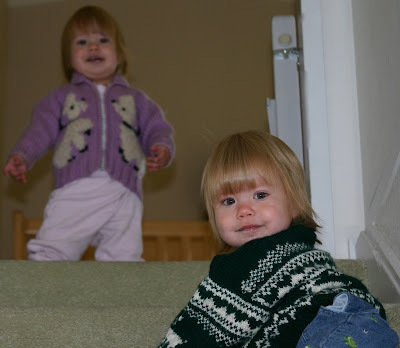 This sweater is now ten years old and has lost only one button in all that time. No holes. No unraveling. No pilling. 2. It is warm. The yarn is of such quality and the weave is so tight that this sweater can be worn as a jacket out in a brisk breeze. By the bye, see the purple sweater in the background of the photo on the stairs? That's the first piece my mother ever knit. And she knit it for her first baby: me! Which makes that particular sweater extra magical because it is over thirty twenty years old and the original zipper still works beautifully, the silky lining is still perfectly intact, and those little poodles are still adorable. That sweater was knit with magic all right . . . the magic of love. Oh my goodness, how wonderful and what an awesome way you have of describing handmade sweaters! And whats funny is, in that first pic I immediately noticed the purple sweater too, and wondered who knitted IT! Then I read further and you answered my question. Love this post! Love the pics! Love the knitted LOVE! My mom knitted my dd a sweater too, so soft and buttery..and we passed it along too. I have my dd's first year pics in it. Its a very special memory! 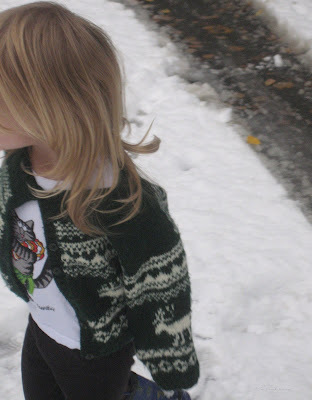 What a joy to find these pictures of the sweater I knit years ago. I just can't believe that it still looks so good and that one of the twins wore it when she was two. Thank you for reminding me of the fun I had knitting this sweater. 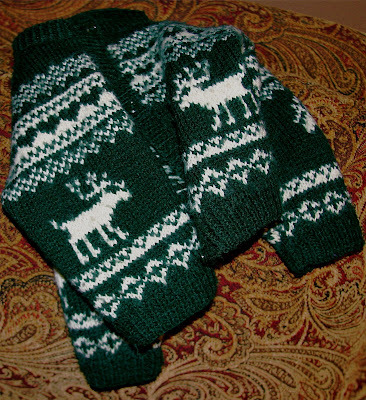 I think I will find the pattern and knit another one for a baby who is due in May.